It's with a very heavy heart that I'm publishing this post, one that I hope will be a fitting tribute to Albert Hadley. As I'm sure some of you are aware, Mr. Hadley died early this morning in his hometown of Nashville. It's strange how very sad I feel, especially considering the fact that Mr. Hadley and I were barely acquainted with one another. And yet, I feel as though I knew him quite well. His work resonated with me like that of no other designer. And truth be told, no other designer has taught me as much about design and living as Albert Hadley did. 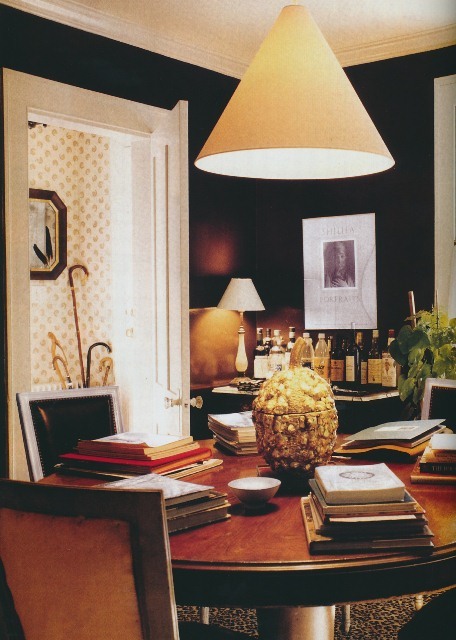 There have been very few times in my life that I've been struck by the proverbial thunderbolt, but one indeed hit me while reading the Elle Decor cover story on Albert Hadley's Manhattan apartment (February/March 2000.) If there is such a thing as a perfect home, that was it. Yes, the rooms possessed more style and flair than most of us can ever hope to achieve in our own homes, but what mattered more to me was the apartment's complete lack of pretension. His home was just that: a home, one in which he surrounded himself with objects that had meaning for him or that simply struck his fancy. You could tell that nothing was chosen for show, but rather because it spoke to him. And in turn, his apartment spoke to me. One of my dreams in life was to meet Mr. Hadley. I was fortunate enough to have spent time with him on three different occasions. But before meeting him, we had corresponded by mail. Shortly after starting my blog, I sent out holiday cards that I had designed using a photo of Sister Parish goofing off and holding an empty Jeroboam up to her mouth. A friend suggested that I mail a card to Mr. Hadley, and so I did. He responded with a very gracious letter in which he wrote, "Sister Parish would be thrilled to be the Christmas card for "The Peak of Chic"! I don't recognize the photograph, but she's certainly belting it out." A few months later, I had a private meeting with him at his office. He was very generous with his time, answering all of the silly questions that I asked him. I was struck by his mild manner and his still-mellifluous Southern accent that seemed little affected after years of living away from the South. Seeing that I was a fellow Southerner, he was especially interested to show me framed drawings and sketches of the work that he did at Rosedown Plantation in Louisiana. I realized after that meeting that Mr. Hadley was not just a great designer, but a kind and courtly gentleman as well. That was not to be my only meeting with Albert Hadley. Close to four years ago, the editors at House Beautiful assigned me an article to write about a wonderful Manhattan apartment designed by Mr. Hadley and his then associate Harry Heissmann. 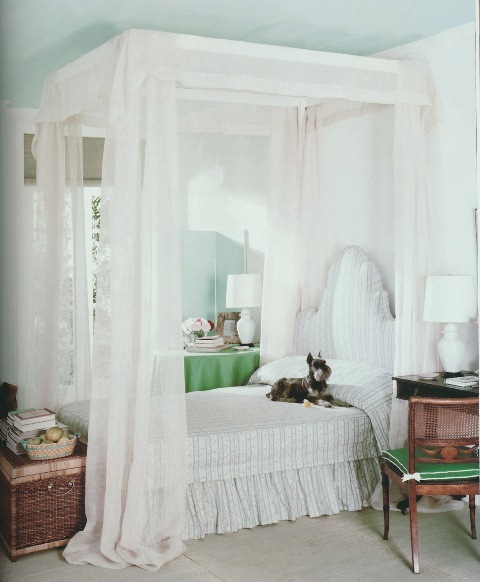 (House Beautiful, April 2009.) Once again, I made the journey up to the offices of Albert Hadley Inc., only this time I was armed with my tape recorder, pad, and pencil for an interview. I suppose that if there is to be one plum writing assignment in my life, that was it! Mr. Hadley was the best kind of decorator. His primary concern was to create homes for his clients in which they could live comfortably and live well. He catered not to his whims but rather to the needs of his clients. 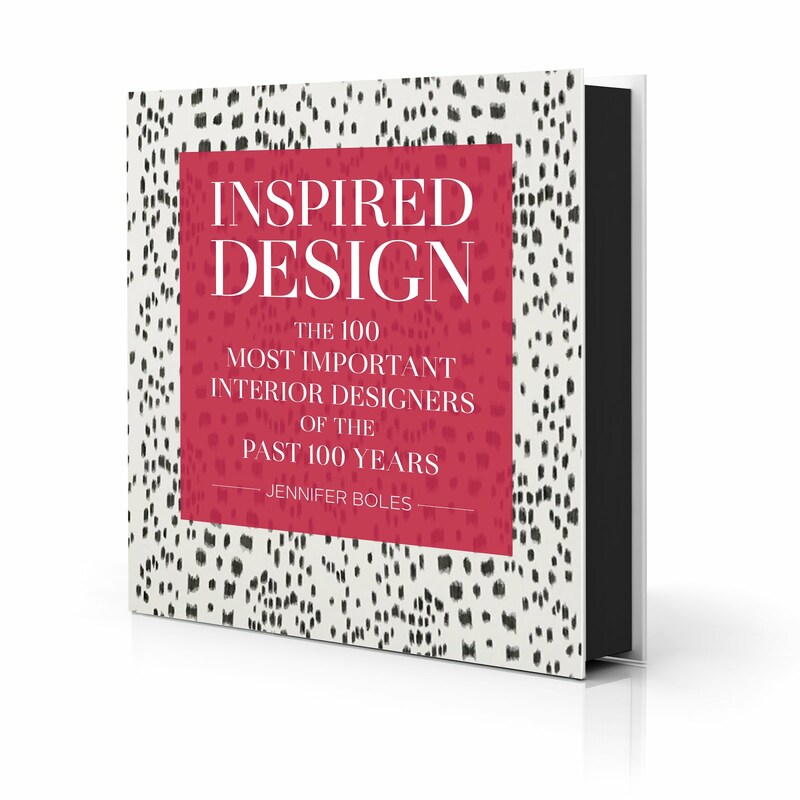 And most impressive to me was that he encouraged young designers to get educated in the history of design and the decorative arts. He believed that without this foundation of knowledge, decorating with any kind of authority is difficult at best. I realize that my tribute to Albert Hadley might border on hagiography, but death has not elevated Mr. Hadley to legend status nor design sainthood. He achieved that long ago during his exalted career. And it might seem hackneyed to say that his passing marks the end of an era, but in my mind, indeed it does. I feel fairly certain that the word "branding" never crossed Mr. Hadley's lips. And I do wonder if a humble, thoughtful person like Albert Hadley could succeed in today's world where never-ending self-promotion has become the norm. There are other masters of design practicing today, and for that we should be thankful. 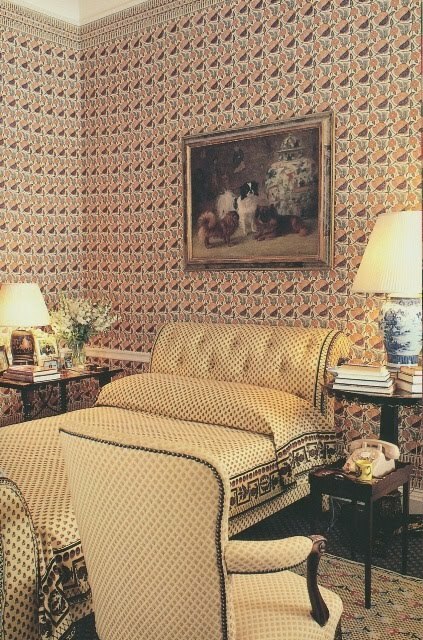 But there will only be one Dean of American Decorators, and for me, Albert Hadley will bear that title forever. The Manhattan apartment of Albert Hadley. 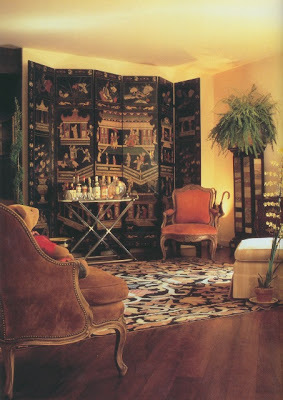 A mid-1970s era Manhattan living room in which Parish-Hadley used a mix of Alan Campbell fabrics. Mr. Hadley's former country house in Tarrytown, New York. Decorated by a young Albert Hadley, this room appeared in a 1959 Vogue article, "Summer on a Shoestring". Mr. Hadley's Southport, Connecticut house. All interiors photos with the exception of the first are from Albert Hadley: The Story of America's Preeminent Interior Designer by Adam Lewis and Parish-Hadley: Sixty Years of American Design by Christopher Petkanas, both terrific resources. it is sad when such a talented individual has to leave us. Your tribute and memories of him are wonderful. 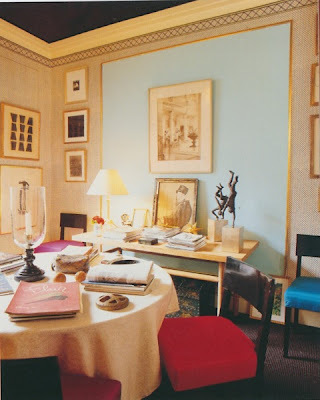 I also enjoyed the retrospective to remind us of his work and style--all the rooms seemed based on comfort and attractiveness, not pretense. Parnassus, Isn't it remarkable how none of the rooms I've featured look dated- and many of these rooms were photographed decades ago. The mark, I think, of a most talented decorator. What a lovely tribute, Jennifer. His talent lives on in pictures, of which I'm sure you will have many more to share over time. Thank you. Thank you Kate. My tear sheet file on Mr. Hadley is quite large and full of all kinds of wonderful photos. Such a great tribute - He was an icon, a giant in the industry. I think the Parrish-Hadley style is actually coming back into vogue. A classic like Albert Hadley never dies. He will live on! Thank you for sharing the impact this talented man had on you. Very moving. I look forward to more posts you offer us on Mr. Hadley! I would love to see those sketches he did while at Rosedown - my favorite of our Louisiana plantations! He is truly inspiring. So sad the passing of one of the greatest designers ever...Now, he will be reunited with Sister, Mark Hampton and so many others.We in the design world were so blessed to have had Mr. Hadley, among us for so many years. May he rest in peace. A lovely tribute. Isn't it nice to know that so many of us were inspired by him. Although it is a sad day, there is some consolation in that Albert Hadley's legacy - not only his designs but his mentoring as well - will continue on for a very long time. The world is a little poorer for his passing, and a little richer for his time with us. Mr. Hadley's influence will be seen for years to come, and that's the true measure of his gifts. Thank you for the moving, personal tribute. John, Very true, and it's something that I see in your work. Jennifer, you put it in such a loving way! He was an inspiration for me. I am very saddened by his passing and I feel as you said: An era has come to an end! But his interiors will be a legacy! He will not be forgotten! Thank you for this wonderful tribute! I wish I could have met him once! Such sad news. He was a true classic. Jennifer, your heartfelt tribute to Albert Hadley was as authentic as Albert's design and the way he choose to live his life. Thank you for posting the little retrospective of some of his work. Both Sister and The Dean will be missed by so many who had the opportunity to know both of these greats in the world of decoration and living beautifully. I am grateful to God to have been born during their lifetimes. A fitting tribute, Jennifer, to the best. What a beautiful and heartfelt tribute to a great man! I also had the pleasure of meeting Mr. Hadley once and he was indeed a gentleman. My parents home was decorated with inspirations from Parish-Hadley and has remained mostly unchanged in 25 years- just some freshining now and then. Mr. Hadley's death is the end of an era anh he will be missed, but his influence and legacy will go on! Interestingly, when I heard of Albert's passing . . . I immediately came here to see if you had written a tribute. And as usual, you never disappoint. Thank you for your kind remembrances of such an amazing man and designer. Thanks for this really beautiful post. It really conveys very well who Albert was as a person. He always made a point to meet with everyone who called and asked to meet him. Fostering and encouraging young talent when ever he came across it. Jennifer this is such a lovely tribute. Thank you for sharing this from your heart. It is one of my great regrets that I never had the pleasure of meeting Mr. Hadley. I am sure that you will always treasure your memories. The pictures of his work you've chosen also remind me of how the best homes are collected, not curated. Done lovingly, over time, they become true reflections of the spirit and soul of the person who resides in them -as his did. 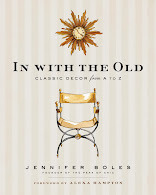 Thank you, Jennifer, for reminding me of the greatness and the humility that resided side by side in Mr. Hadley - a true icon of American design. A lovely tribute. 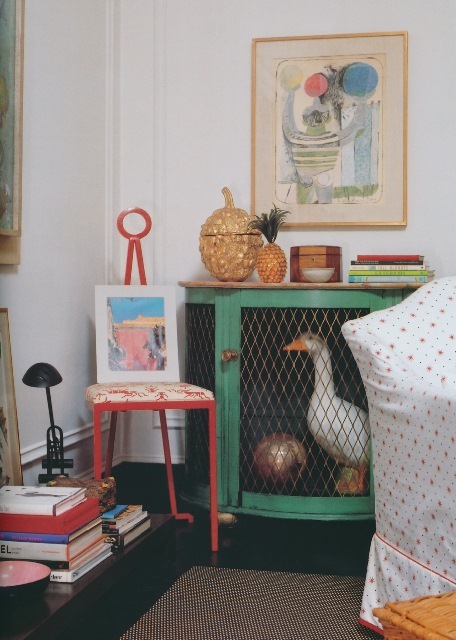 I'm charmed by the presence of that golden melon/gourd in three of the photos from different times and places. It must have been a favourite personal piece, a go to for that 'dot" of gold when styling a space. Another reason his work was so easy to relate to, there is something of himself in each gorgeous project. Of course, it was a sad post to have to write, but it wasn't difficult to write. There are so many things that can be said about his warm personality and his amazing talent. A lovely tribute to a legend and gentleman. Jennifer thank you for giving us all an opportunity to remember such an incredible talent but also such a wonderful man. Looking through the pictures, its obvious how has he has influenced us all....So Classic! Jennifer thank you so much for your thoughts and images of Mr Hadley's design works. An icon indeed. His personality comes shining through your words and encounters with this great man. there can be no doubt! Thank you. I had no idea he had passed. Lovely post. This is a lovely tribute. I, too, am sad about Mr. Hadley's death. What a great, great man! I think my favorite rooms from the ones you displayed here are the ones in his Connecticut home and the bedroom designed for a bachelor. I envy you having the chance to meet him as he has long been one of the designers I admire most. Like you said, this does mark the end of an era. There are not too many designers I get this excited about these days, and everything seems so transient now. The emperor's clothes and all that. 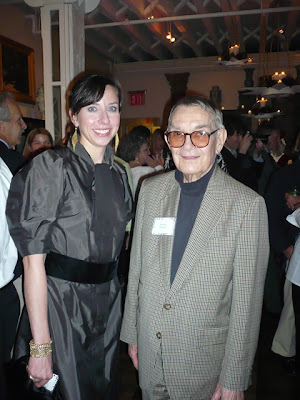 Albert Hadley was all about classic design with a twist, and I will miss him mightily. Thank you for such a beautiful tribute. Amazing inspiration- forever! I never met Albert Hadley but he was plainly on of natures gents and you have bought him to life beautifully. He said that the process of creating beautiful interiors is like creating a musical composition with the high and the low notes... it requires striking the right chords. He'll be greatly missed...such a class act. Thank you for the lovely post and tribute. Thank you for writing this heartfelt tribute.It always surprised me how simply Mr.Hadley lived particularly in his Manhattan apartment. Alexa Hampton did an interview and tour some years ago and it was fascinating. 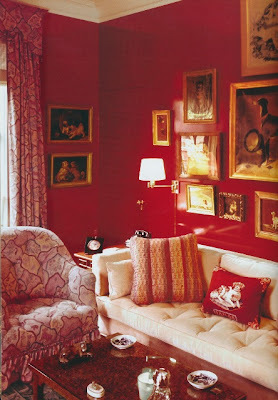 It's strange to say in the context of decorating but the world has lost a champion of substance over style. What an extraordinarily gifted, original and humble talent -- and what a beautiful tribute. Thank you, Mr. Hadley (and Ms. Boles). Jennifer this post is beautiful, an eloquent and worthy tribute to Mr. Hadley. Jennifer, would you be willing to post your Sister Christmas card? You have "Peaked" my curiosity! Mr. Hadley is the embodiment of all we need to preserve in design, and I am certain he appreciated your determination to do just that. I always felt that as long as he was with us, we had a living link to the stunning duo of Sister Parish and Albert Hadley. Contemporary Classicists (you being my personal front-runner!) keep in in the daily blog world, and I thank you. Dana, I will try to find a copy of the card in my files. Thank you for the thoughtful comment! 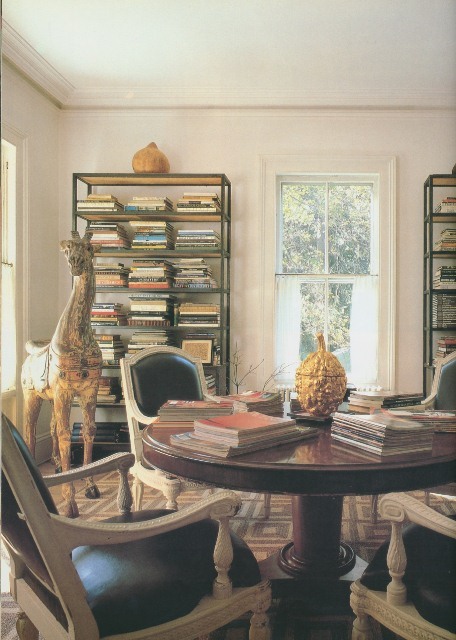 My favorite rooms are always the personal homes of designers. I remember the first time I saw the last photograph- it took my breath away, and still does. His death is the end of an era. I imagine he is smiling reading your lovely tribute. We can only imagine that lovely man sharing a cocktail this evening with Sister and Mr. Hampton! How very, very lucky for you to have spent time with him - four times, no less! I found your tribute so thoughtful and touching - thank you. P.S. You can add me to the list of "Christmas with Sister" viewers! A beautiful, heartfelt, and appropriate post. He was, indeed the opposite of the "branding" mania going on right now. I hope he never saw "million dollar decorators"! His understated elegance; appreciation of comfort and simplicity; and completely timeless design. Your readers commented that none of those pictures, (NOT ONE!!) looks dated! In fact, the very first one from Vogue; I am going to use in a bedroom I am doing right now!! That white voile and that blue ceiling.......look at that headboard! Current!!! Totally timeless!!! Brilliant and loving post. Thank you. He truly will be missed. I did not know of his passing, thank you for the conveyance of news. 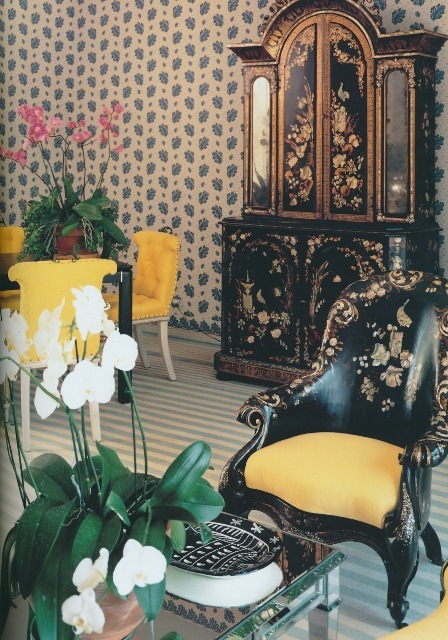 Mr. Hadley was respected by his clients and admired by other designers. The Parish-Hadley offices were near Madison Ave. and 69th Street, and I often saw them through the shop window creating masterpieces from samples from the D&D Building. My decorating assistant job at SUM was right around the corner. His work always looked effortless, and in the Parsons tradition, the rooms were stylish but never fussy or trendy.